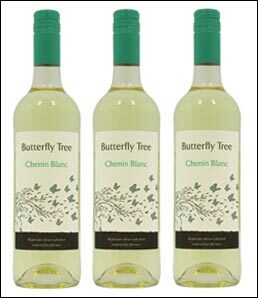 Lanchester Wines has introduced its first commercial glitter wine label to its Butterfly Tree Chenin Blanc, having recognised that a large proportion of consumers select wine through bottle design. Emerald green glittering butterflies are seen to fly across the label which prominently features the South African mopane tree (Colophospermum mopane) commonly known as the Butterfly Tree. Butterflies and tree were present on the wine’s previous label, the redesign has simply enhanced these features ensuring the bottle immediately stands out to customers. Lanchester Wines worked closely with Thornton Print in Newcastle to create the unique glitter label which combines a two colour flexo and screen print technique finished with a tactile varnish to which silver glitter particles are added. This technique makes the butterflies glitter while adding instant touchability to the label. The vivid emerald green colouring continues throughout the bottle including varietal mark, screwcap and the bottle’s digitally printed reverse label which features Lanchester Wines’ carbon minus stamp. White space has been carefully managed across both front and back labels to ensure the impact of the glitter butterflies is maximised while on the reverse, wine information is easier for the consumer to read. Lesley Cook Lanchester Wines’ buying manager says: “This is a brand evolution rather than revolution. The Butterfly Tree range is extremely popular with both our on trade and off trade customers, and it was important we didn’t lose brand equity with our design changes. Tony Gray at Thornton Print says: “We’ve closely worked with Lanchester Wines for the last nine years and have introduced this printing technique to our service offering specifically for use on the company’s wine labels. While the technique has been used within printing previously, we believe this is the first time it has been used on a commercial wine label. Lanchester Wines is planning to extend the brand redesign across other wines in the Butterfly Tree over the coming year.